Mike Smithson at Political Betting highlights some crucial stats about Labour voters – they are dispirited and less likly to vote compared to likely Conservative voters. And that too by a significant margin. In previous elections Labour has benefited that in seats where it mattered, the marginals, it found it easier to get its people out. Where it doesn’t matter, in Tory or Labour strongholds, then supporters have been much less motivated to vote – one of the big drivers behind the the seat calculations and a key reason why the system seems to work against the Tories. Chris is a regular contributor to Liberal Conspiracy. He is an aspiring journalist and reports stories for LC. This has been a worry for a while, Labour’s core vote feel alienated and left behind. That could be the key to the next election, as it usually is (core votes on both sides). Pedantic point, but if labour voters don’t turn out to vote vote, how are they labour voters? The point actually highlights the fiasco of newlab, jettisoning principle in pursuit of floating voters, and so alienating those who’d they’d taken for granted and once they’re gone, who’s to say they will return? Perhaps better to say those folk who might formerly have voted Labour won’t turn out to vote. I don’t see anything unusual in those plots, though I thank Mike for producing them. Potential Labour supporters are less likely to turn out than Conservatives? Hardly news. People who are negatively inclined are more likely to act on those feelings, and Conservative supporters tend to be more negative about other parties than potential Labour and LibDem supporters; a similar phenomenon is observable at the BBC switchboard which will be bombarded with complaints rather than praise after any controversial programme. If you draw a straight line through the Conservative and Labour plots, all that you can see is sampling difference most months with a few blips. In Sept/Oct 2008, you can see the post-conference increase in intention. 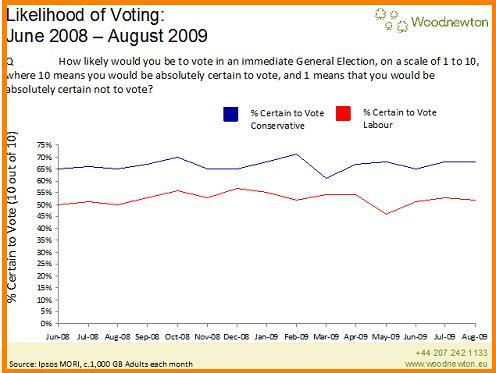 In May 2009, you can see a big drop in Labour intention, immediately following the Telegraph’s expenses revelations. That blip was quite interesting because it suggests that Tory supporters are more cynical than Labour supporters about MPs’ honesty. However, the Labour likelihood to vote quickly bounced back to the straight line. What happened in Feb 2009 that caused the dip in Conservative intention the following month?